This wonderful roasted mushroom supper is every bit as colourful as it is healthy, as fresh as it is unforgettable. 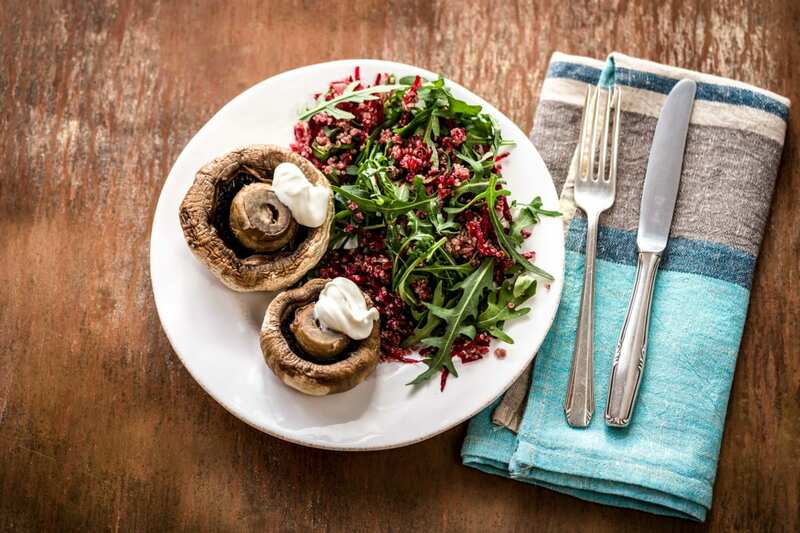 A hum of rich mushroom, peppery edged rocket, fresh clean flavours of beetroot, creamy goat cheese and nutty toasted sunflower seeds fills each and every bite of this dinner with joyous colours and textures. Preheat the oven to 200°C/180°C fan-forced. 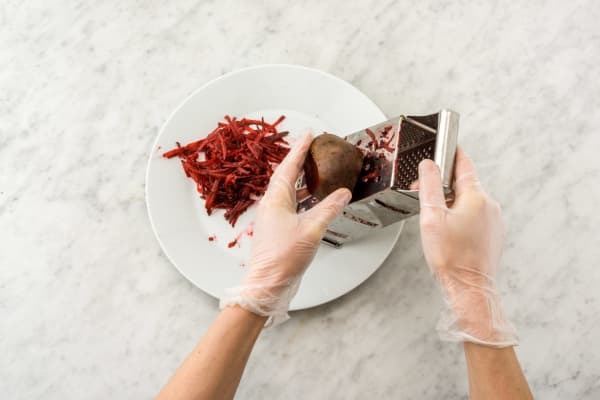 To prepare ingredients, wash and grate beetroot, wash the rocket and quinoa, tear cheese into chunks. 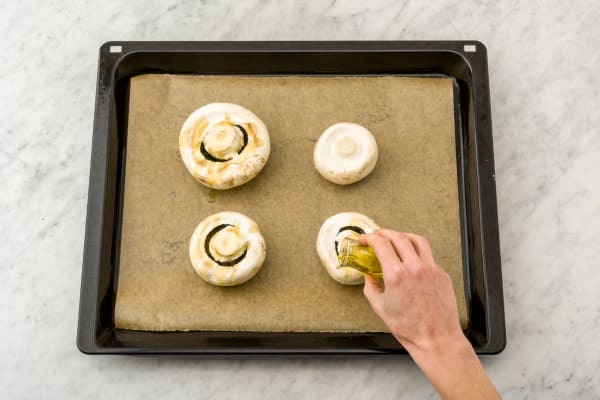 Place the field mushrooms cut side up on the prepared oven tray and drizzle with the olive oil. Season with salt and pepper and cook in the oven for 20-25 minutes or until tender. Meanwhile, place a small frying pan over a medium heat. 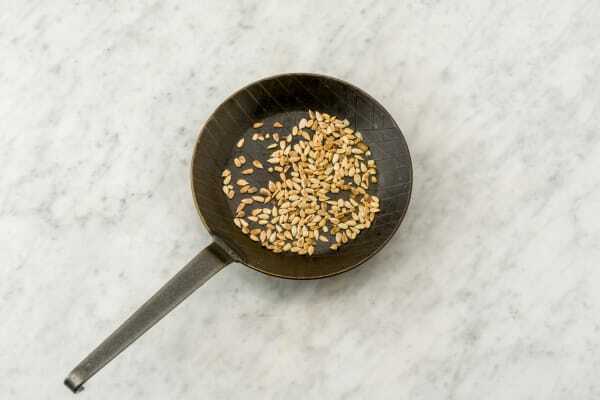 Add the sunflower seeds and cook, tossing, for 1-2 minutes or until toasted. Remove from the pan and set aside. 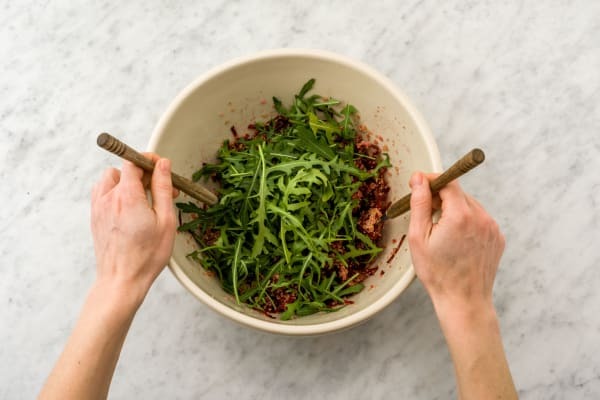 Place the quinoa and water in a medium saucepan and bring to the boil. Reduce to a simmer and cook, uncovered, for 12-15 minutes or until tender. Drain. Transfer to a medium bowl. Stir through the beetroot, sunflower seeds, and rocket. Drizzle with a little olive oil and the red wine vinegar. Season with salt and pepper. To serve, divide the beetroot quinoa and mushrooms between plates. Top the hot mushrooms with the goat cheese.